All showers are actually not created equally. Showering the right way can optimize the look of your locks and your skin. Your hair can come out shining and your skin can come out glowing after each shower. To ensure that you’re showering properly and making the most out of cleaning your hair, scalp, and skin- there are adjustments you can make. Although really hot water feels great to some people, it can be a bit harsh on the hair, scalp, and face. Just like hot tools can damage your hair, the same is true for hot water. Colder showers are gentler and cause less harm to already damaged hair. If slightly cool water is too uncomfortable, try not to let the water temperature go any higher than just warm. The heat can strip off too much of your natural oils, leave the cuticles open, and cause the moisture to leave. Hot water can cause damage but so can cold. For instance, Cold water helps to seal the moisture in your hair and increases shine – but will also flatten the hair, making it look lack-luster. Hot water helps to open the pores and strip dirt, excess oil, and grime off your hair–not to mention it feels great too! The adverse effects of hot water on the scalp is that it can lead to frizzy hair and cause your hair to become dry and brittle. It’s best to opt for lukewarm water as it’s a reasonable solution and won’t ruin your showering experience. Many make the mistake of merely wetting their hair, slathering shampoo, rinsing it moments after, and suffer from an oily or flaky scalp as a result. Take the time to make sure your hair is fully rinsed and massage the shampoo into the scalp. This can help dig up dirt and stimulate circulation. Don’t pay attention to getting every strand of your hair, just focus on the shampoo massaging your scalp. The purpose of shampoo is to remove the dirt, product buildup, and dead skin cells from your hair. One to two minutes extra in the shower can make all the difference in reducing scalp oiliness or dryness through effective exfoliation. Stimulating the circulation of blood under the surface of your scalp is an important aspect of maintaining and regulating a healthier head of hair. Increased circulation helps to direct much-needed blood containing vital nutrients, minerals, and vitamins to your scalp. This helps to strengthen your hair follicles from within (where it counts) and can even encourage hair growth over time. It’s best to use an essential oil with your shampoo or conditioner to help increase the circulation of blood. It also works to keep your hair and scalp, clean, fresh and nourished for longer. After stepping out of the shower, soak up excess water with a towel. You shouldn’t use a regular bath towel. An average towel will remove the moisture from your hair with all the excess water – leaving it very dry. They can also cause your hair to break or get frizzy. Therefore, you should use a microfiber towel or a cotton t-shirt. You should pat your hair dry instead of wringing it out. This will maximize moisture retention capacity without stripping your hair of all its moisture. Try to let your hair dry naturally so don’t blow dry your hair right away. You should wait five to ten minutes and then proceed to fashion your hair to your liking. When it comes to blowdrying your hair, be sure to do so on the coldest setting (don’t even touch the heat option!). Make sure to keep it at a minimum of 6 inches from your hair. This will allow your hair to dry more naturally without putting too much strain on the strands. Allowing your hair to retain most of the natural moisture and not stripping your hair follicles of the much-needed proteins is important to keep them strong and healthy. Conditioning is something that is often overlooked during the cleansing routine. Undervaluing the importance of conditioner will only lead to long-term damage over time. It’s important to note that shampoo is for cleansing the scalp, whereas conditioner enhances hair texture and volume. It’s primarily used to specifically treat your hair. A good conditioner can help deal with dry and unmanageable hair. Conditioner works by binding the cuticles around the hair follicles together and helps lock in the moisture. It will also give your hair more volume and strengthen the strands at the same time. This is largely due to the positive atomic charge of the surfactants contained in the ingredients of the conditioner and your hair’s natural negative charge. The difference between the two allows the conditioner to stick to your hair follicles, forming a light, protective envelope around the hair. When you skip the conditioner, you basically leave your hair follicles vulnerable to become dry and damaged. So if anything, it’s recommended that you cut down on the costs of your shampoo and invest in a good conditioner, as it plays a more important role in maintaining and achieving a healthy head of hair. Most importantly, using the right shower products can make all the difference, especially for your head! Hair is delicate and fragile and therefore should not be treated poorly. Scalp damage can accumulate after years of poor maintenance. Using a non-therapeutic shampoo can be compared to eating empty calories. Make sure the product you use contains a host of nourishing ingredients for ideal scalp health. Products with sulfates and parabens have been known to cause skin irritation and allergic reactions. Recent studies have even found that they can also be carcinogenic and cause eye problems in children. There are countless natural products that contain healthy ingredients such as jojoba, botanical keratin, and rosemary oil. Your health is worth the extra few bucks. It’s also important to limit the number of products you use. Hair sprays, mousses, and gels tend to cause buildup that is hard to remove. These products can clog your pores and lead to your hair falling out. If you tend to get frizzy hair, you should apply a leave-in conditioner or a smoothening serum after drying your hair. If you tend to have dry hair, be sure to use a product free of alcohol since it dries out your locks even more. It’s actually recommended to shower only two to three times a week. Yes, you read that correctly. While it may sound kind of dirty to some, it is freeing for others. There are definitely people that need to shower every day though, so this rule doesn’t apply to everyone. If you exercise daily, definitely hop in the shower. Not showering after a workout makes your skin a breeding ground for bad bacteria. The sweat that is left behind also can cause rashes and breakouts. Showering too much, or every day can dry out your skin. There is an outer layer of skin protecting your healthy skin, and when you shower every day you are getting rid of that layer before it’s able to repair itself. Your hair doesn’t need to be washed every time you shower either. The less you touch and mess with your hair, the less damage you could cause. Over-showering can strip away the natural oils in your hair, leaving it to become dry and frizzy. If you color your hair, it’s great to know you don’t have to wash your hair as often as you thought. The less you wash, the longer your color stays. 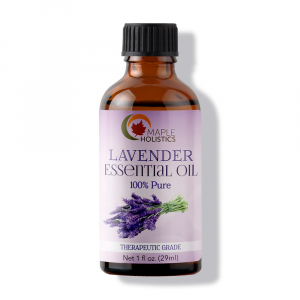 Essential oils are steadily gaining popularity in the modern age as more and more people start looking for natural alternatives to chemical-based shower products. They’re effective, clean, and healthy. They’re also incredibly versatile and can be used alone or in combination with other essential oils or ingredients in a DIY recipe. However, there are a lot of different essential oils out there and selecting the right ones for the job require doing some research. So to make your life easier, we’ve compiled a short list of our Top 3 Essential oils for showering and use for your hair. 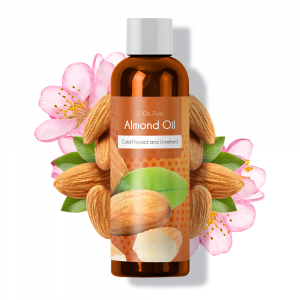 Almond oil is a rich source of Vitamin E which is an incredibly potent natural antioxidant. 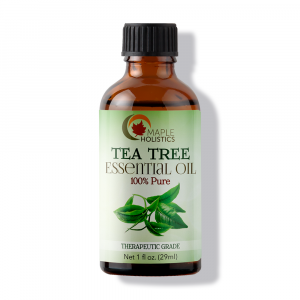 It helps build and repair tissue while also strengthening hair follicles and even encouraging growth. It has a low comedogenic rating, which means it won’t block or clog the pores on your scalp. 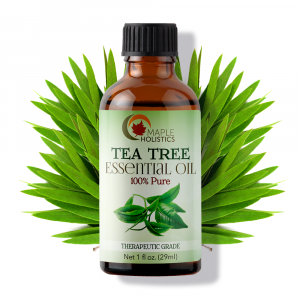 Tea Tree oil is a potent natural antiseptic and an antimicrobial agent. 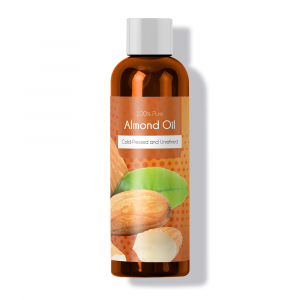 It can be used to help remove germs and bacteria from the surface of your scalp as well as help stimulate the circulation of blood to your scalp. This helps bring much-needed vitamins, nutrients, and minerals where they’re needed most. 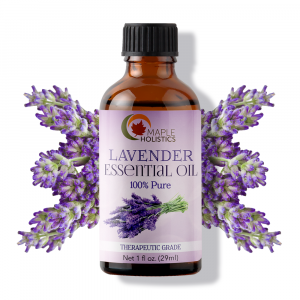 Lavender oil is a fan-favorite for a variety of reasons. It has a wonderful natural scent that lingers for quite sometime after use. It’s both a potent natural antioxidant and a natural antiseptic, which means that it can rid your hair of germs and bacteria. It can also prevent free-radical damage before it occurs. It’s easy to add to natural DIY recipes or even to an existing conditioner or shampoo. It, therefore, makes every cent you spend on it, worth it. Read about Shampoos that contain toxins that harm hair here at Maple Holistics! You used to start each morning or end each day with a hot shower – until you read this article. You’ll now hopefully be able to make the most out of your showers and reap the benefits for both your body and your mind. Even if you’ve been washing your hair the same way since you were eight, it may be time for a change. It’s great to learn new things about everyday chores and general life hacks just to make things better and easier. It also makes for a far more interesting experience in general. After sticking to these guidelines for at least a month, you’ll be sure to notice some key differences in the quality of your hair and skin. You’ll also hopefully save some money since showering and washing your hair properly can limit the number of products you need to use after the shower. It may take time to see results, but once you do, all the change will have been worth it. The very best showers are usually taken when we’re tired or filthy, so get tired and filthy!